Over the next few days I’ll be going through the archives to show you what Sound Travels has been up to over the last year. 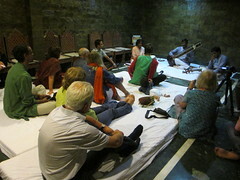 We’ll start with the fabulous Rajasthan International Folk Festival trip of October 2012, where ten happy Sound Travellers, who booked through Songlines magazine, explored the music of my favourite desert state. We began the trip with a party and an interactive session with Iranian daf and tonbak maestro Fakhroddin Ghaffari… and out came the cameras! 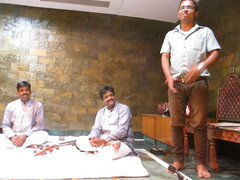 The darun-playing worshippers of Gogaji, the Rajasthani snake god played to us in their village of Bajrangsar. Their twin-faced drum resembles the African ‘talking drum’, and similarly, its pitch can be changed by squeezing the leather strap wrapped around the narrow centre. The musicians sing, jump up high and make rhythms by stamping their feet and jangling the gunguru bells wrapped around their ankles. Nick enjoys a shisha(or at least he claimed to) with Mamphula Ram, the famous chang player. Next we headed to Jaipur where we spent a magical evening meeting dancers and musicians from the snake-charming Kalbeliya community. Bad lighting, but you get the feeling! After a day of site-seeing and shopping in Jaipur, we then had a surprise dinner in Amber, and concert from UK beatboxer and sound artist Jason Singh, in collaboration with morchang-player and multi-percussionist Rais Khan. Our next stop after Jaipur was the holiest of holy pilgrimage sites, the Ajmer Sharif. Forty-minute drive from Ajmer is the the beautiful lake-town of Pushkar, home to Nathoo Lal Solanki, the best nagara player in the world! 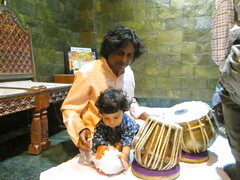 After a tour round Pushkar with my favourite babu/guide Mukesh, Nathoo led us in a drumming workshop. … til the small hours.